A very welcomed dining experience to the neighborhood. 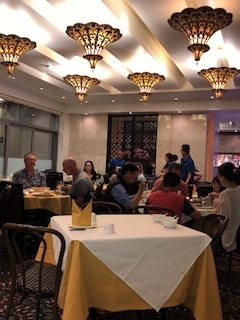 This is a Beverly Hills premium Restaurant Row, where many have failed, but Capital Seafood promises to become Beverly Hills royalty. I was treated like a quee,n given the best of the best food on the planet. The lobster was a 6 LB. lobster. King Lai was my gracious host; he is the manager of Capital. He was born in Venezuela, so he speaks fluent Spanish and Chinese. He is charming and super funny. He showed me all of the little nuances of Capital amazing food. King was the manager at harbor Seafood on the Westside. He has been married for 30 years and has 2 kids. He knows the restaurant business; he has working at many many restaurants through out the years. Randy Tsu is Capital’s owner; he hired King to do the day-to-day management job inside the restaurant. Then there was my server Jayson Absalon, who came from the health care industry. This is his first restaurant job. It just seemed like for a newly opened restaurant all of staff was enjoying their duties and everyone seemed like one big happy family. 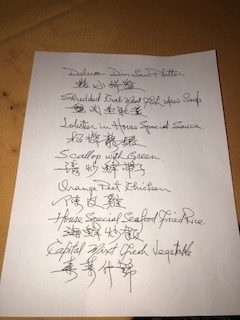 Second in command Oliver Wong was super sweet and made my culinary experience one that I will remember for a very long time. 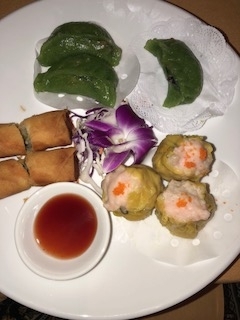 Deluxe Dim Sum Platter, 2 pieces, Shu Mai, vegetable dumpling, egg roll. They have a very large separate dim sum menu that they do during the day. I just love the Shu Mai. 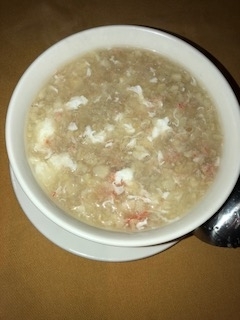 Fish Maw with Crab Meat Soup, Served with egg white. This is a very soothing soup with rich crab flavors and the egg white gives it a smooth creamy texture, I would absolutely order this one again. Maine Lobster With House Special Sauce. The lobster was huge, got t be over 6 lbs. Their sauce will take your breath away, it sweet and spicy with nice garlic essence. The lobster is so tender and flavorful; I will never be able to eat a live lobster again after this extravaganza. Scallops in a white wine sauce. 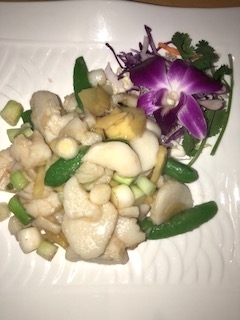 The scallops are large and the sauce is delicate and perfect, a real winner. 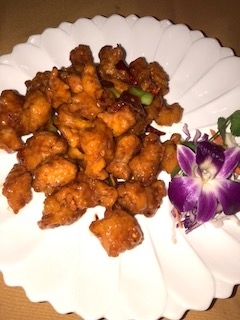 Orange Chicken, Orange peel, red chili, green onion. You get a real orange flavor almost like mandarin orange, but its very apparent. I’ve had many orange chickens but this dish is the best of the best. 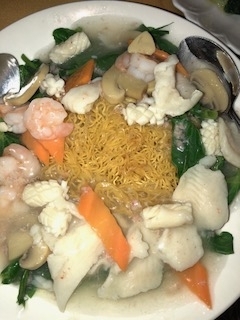 Deluxe Seafood Pan Fried Noodle. This is a small noodle, but the edges are crispy, with nice array of fresh fish, one of my favorites of the evening. 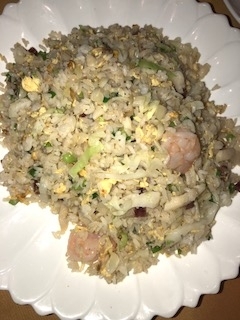 Yang Chow Fried Rice, Shrimp, BBQ Pork, egg, green onion, peas and carrots. This rice is very fragrant, they do not put any sauce in it, so its super light and fresh. Baby Bok Coy In Superior Broth with Garlic. 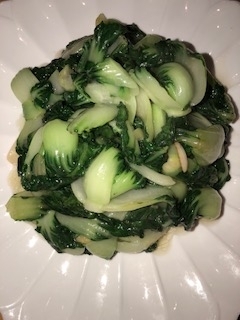 Tiny Bok Choy’s adorn this very garlicky vegetable dish, I just loved it. I had a lovely Chardonnay to accompany my delicious dinner. Domaine Anderson, Anderson Valley 2015. It want great with all of the seafood that I tried. What I can say about Capital restaurant it is will be my go to favorite. 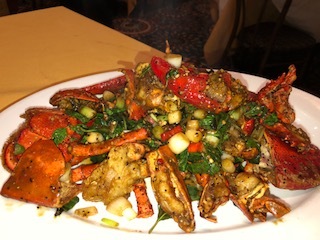 With a huge menu and just about everything for anyone, whether tour vegan, meat eater, and pescetarian you will find scrumptious delicacies here at Capital Seafood. You must try this place!